Masia Olivera is a tourism centre which is totally integrated into the Penedés countryside, surrounded by vineyards, and made up of several houses, all fully independent with gardens and outdoor areas which the younger members of the family will thoroughly enjoy. - L´Olivera Gran: A typical Catalan farmhouse, quite simple and with a lot of character. Vines in the form of a trellis and garden furniture where you can enjoy the peaceful summer evenings. The house has a fully equipped kitchen with a dining room in the actual kitchen itself, and two double rooms and one single. - L´Olivera Petita: This apartment is very functional and modern, small and cosy, in the style of a country loft. It has a double room. It shares the patio with the "L´Olivera gran" farmhouse, and occupies the place which once upon a time used to belong to the stables. It has a fully equipped kitchenette. There are two double rooms and a double sofa bed. - L´Olivera de Dalt: This is a very functional apartment, all on one single floor and next to the "L´Olivera de baix" farmhouse. It offers an interior garden of around 100 m2, exclusive for the guests of this house and the house next-door, with a barbecue and terrace, a table and wooden benches. 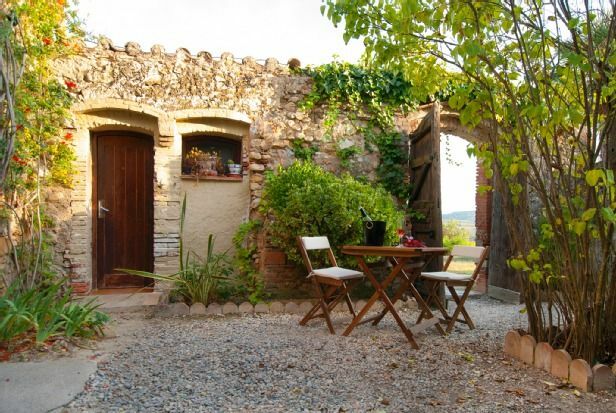 Built in the typical Catalan style, with wooden beams and Catalan farmhouse furniture. It includes two double rooms. - L´Olivera de Baix: Originally, this farmhouse used to belong to the farmworkers, and today has been renovated for tourism. It has two double rooms. - El Celler de l´Olivera: This is the old cellar of the farmhouse, which has been totally renovated into a pleasant and rustic apartment. It is situated facing one of the swimming pools, offering magnificent views of the vineyards. It has a spacious and exclusive garden area, with pine trees and grass, along with its own barbecue. Built in a rustic style, with wooden beams and ceilings and stone walls. The house is made up of two rooms, one of which has bunk beds. - WI-FI - There are two swimming pools , one for the exclusive use of the guests staying at the "El celler de L´Olivera" and the owners and the other for the remaining apartments. Each of these are 6 x 12 m., and 2.5 m deep, and correctly signposted. They can be used from the month of May onwards at specified times. - Sports areas : Made up of an outdoor area of 300 m2 of terraces and in the centre it has a tennis court. The land offers table tennis, mountain bikes, basketball court and several benches to rest after so much sport.